In this post you will understand that there is no point in trying to have a view on Nifty each and everyday. It is a futile exercise and a waste of time and should be avoided by traders. What matters is your strategy, plan and discipline, view is secondary to these things. I am not saying that you should not have a view at all, you should have a view, but it should always be a medium to long term view and you should take a positional trade according to that. After all your today’s view on Nifty, even if correct, will not make you rich. During these volatile times, I am getting a lot of questions on whats my view on the markets. Frankly, I never have any view – I just do my job with a proper plan, discipline and most importantly hedging my positions. And I do not care what the “EXPERTS” are saying. Let me tell you that even highly experienced technical analyst views goes for a toss during these kinds of markets. For example yesterday every analyst declared that Nifty will soon hit 8000. So my advice is just ignore the noise around and do your job. And if you are a derivative trader then I request you with folded hands to please “hedge” your trades. You do not know what may happen overnight. Only a good hedge will protect your money. Hedging reduces your risk drastically and allows you to sleep well. DO NOT GET GREEDY – The markets are ever ready to eat your money. DO Not let that happen. During these turbulent times a hedge will act as a great money protector. 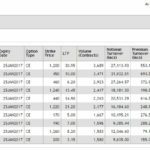 Max profit in this trade is if Nifty is above 7700 on 24 September 2015, the expiry day – which will be 152-115 = 37 points and max loss will be 100-37=63 points. So now either you lose 63 or make 37 – there can be no other loss. But what if Nifty goes up tomorrow by 100 points and VIX drops? You will be in 10-15 points profit in one day and close the trade. That’s it – all worries gone and you made a quick profit. Compare this with trader who sells naked 7700 PE options. If tomorrow Nifty goes up great, probably he makes 20-25 points. But what if it falls another 100 points? He will stop out with 50 or more points loss, whereas the hedged trader can wait for Nifty to reverse, go up and take profits out. He can wait because he knows that his max loss is only 63 points and that there is no point in hurrying to take the loss. Markets can go up and down. Today if it has fallen down, tomorrow it may rise again. September 2015 expiry is still 14 days away. Just 1 day rally and a drop in VIX will do its job. Disclaimer: If you trade the above strategy the risk is yours. Of course the profits is also yours. 🙂 The information is for your study only and is not a recommendation to buy or sell these options. Do let me know if you close the above trade in profits. So, if you want to be a good trader and enjoy trading and create wealth over the years, please learn to hedge. Your email “with an example” is highly appreciated. It demonstrates your commitment to us all. Lot of thanks for your golden advice more valuable than gems. It makes people healthy wealthy and wise. Thank u sir I was unable trade bcoz I am out of station.Thanks again. Sir what will be the strategy for post US fed rate meeting. Today since nifty closed but SGX NIFTY bit high. Shubha, please check your email. I have sent the strategy.